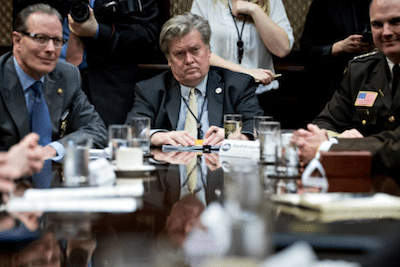 By Larry Ceisler | January 4, 2018 When the blurbs from Michael Wolff’s new book about the Trump White House started popping up online, my left-leaning millennial employees found a reason to break from work to praise their new hero: Steve Bannon. Yes, in these topsy-turvy days, yesterday’s Darth Vader becomes today’s Luke Skywalker. The man who was so loathed for the last 18 months has now become a stand-up guy. Our politics are so fickle that anyone advancing our respective agenda gets a pass when he or she says or does something that can be perceived as redemptive. As a political centrist who works in communications, I’ve come to recognize that both sides have a tendency to look for this redemption. In the Trump era, Democrats especially seem to hope that someone has “seen the light.” I am not saying that Bannon and the rest of the White House staff would now suddenly be welcomed at my neighborhood food cooperative. But they did just help attack Democrats’ political enemy number one, so liberal media and liberal voters seem to be forgetting some of their previous sins. Meanwhile, some on the right seem to only now recognize Bannon destructive politics. I am not sure what I truly believe about the motivation of the Trump inner circle in trashing the President. I am not sure I even believe the reported quotes from the book, because one fallout from the Trump effect is that we are free to take as fact something that cannot be proven. In the spirit of the great Trump Brand marketing machine, what matters is what sells. Still, the allegations are scandalous and could hurt Trump with the Breitbart following. So, progressives, Hail Bannon—for now. Next week, he’ll run afoul and remind everyone where he stood originally. Maybe, then, the more important thing to take from Bannon’s apparent betrayals is that our politics has reached a point where most people think there are sides, and everyone is absolutely on one or the other. People on the Right now treat Bannon like he’s Benedict Arnold. People on the Left treat him like he’s a partially redeemed truth teller. He’s neither. Larry Ceisler is a Pennsylvania-based public affairs executive. If you'd like to reach him, please email smerconishwriters@gmail.com.